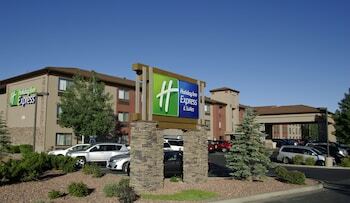 When you stay at Holiday Inn Express Hotel & Suites Grand Canyon in Grand Canyon, you'll be near the airport and 13 minutes by car from Grand Canyon Clinic. Featured amenities include complimentary wired Internet access, a business center, and complimentary newspapers in the lobby. Free self parking is available onsite. When you stay at Thunderbird Lodge - Inside the Park in Grand Canyon, you'll be in a national park, within a 10-minute drive of Hopi House and Hopi Point. Free self parking is available onsite.